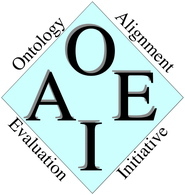 In the OAEI 2018 campaign, as last year, we had two evaluation platforms: SEALS and HOBBIT. And a total of 12 evaluation tracks: anatomy (seals), conference (seals), multifarm (seals), complex (seals), interactive (seals), largebio (seals, hobbit), phenotype (seals), biodiv (seals), spimbench (hobbit), link discovery (hobbit), iimb (seals), knowledge graph (seals, hobbit). Evaluation was offered in one of the platforms or in both as in largebio and knowledge graph tracks. Links to the pages describing the results for each track can be found at the bottom of the page (complete results will be available soon). The OAEI 2018 had 22 systems registered although in the end only 18 were submitted and evaluated, from which 5 were new participants (CANARD, ALOD2Vec, DOME, Holontology, EVOCROS).